We had a nice, smooth ride last Saturday, most of which on fresh new pavement, from Farmington north to Strong and New Vineyard. Little traffic and great mountain and river views - a real Maine tour! Many thanks to John MacDonald and his "crew" for a great ride. 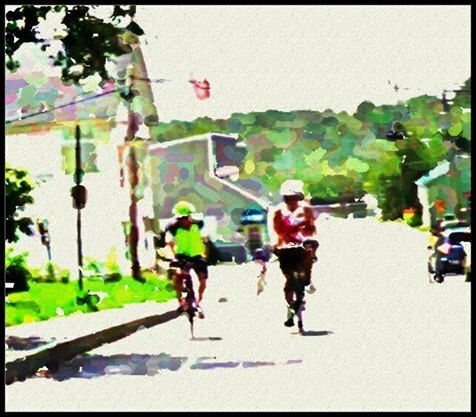 This Sunday we will revisit a club favorite as we ride from Gardiner to Bowdoinham. As always, we hope you can join us! "Back Roads to Bowdoinham" - a tour of the southern Kennebec Valley through Gardiner, Richmond and Bowdoinham. START: 9:00 AM, at the Laura Richards School, Rt. 201 in Gardiner, 1.5 miles south of the junction of Rt. 201 and Rt.s 126/9 (the junction near the A-1 Diner). The school is a new brick building with a "spiked ball" sculpture, on the west side of Rt. 201, on the left past the Gardiner Armory (just as you enter the "thickly settled" area). Park in the lot on the north side of the school. Kennebec Valley Bicycle Club rides are open to members and to the cycling public. Helmets are required of all riders at KVBC events. It is also recommended that you bring with you on KVBC rides: a map of the area in case you stray off route; tools for simple roadside repairs, especially a tire pump, spare tube and/or patch kit; water bottles or hydration systems; personal ID and a small first aid kit; and money for purchasing snacks & drinks en-route. In case of severe weather, scheduled rides may be postponed or designated as "show & go" rides at the discretion of the ride leader. We welcome suggestions for improving our rides and encourage active participation of all members. For more information, contact Jim Merrick at 293-3784 or hjmerrick@gmail.com, or follow us on Facebook.